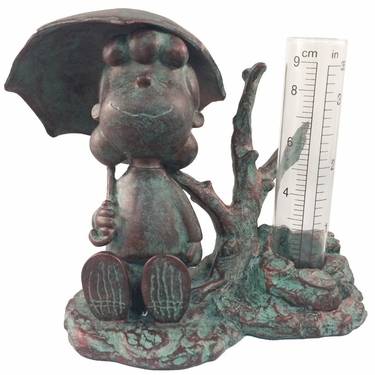 For the Peanuts Lucy fan of your life, or simply for any avid Peanuts Character collector, we're thrilled to offer this very limited edition statue - an original Lucy Rain Gauge in a garden collectors Patina Bronze finish! Simply gorgeous and will look great in your garden, in your home, on your piano, or by your Peanuts Characters throne in your office. Recently we found a lost pallet from 2003 in one of our manufacturer's warehouse that contained Officially Licensed Collectable Peanut Garden Statues - instant classic collector items! Weather-Resistant Solid Cast Resin: 4.5"H x 5.5"W x 4"D, removable glass rain gauge.